After giving brief introduction of Cloud few days back I thought to give some light on more details of Microsoft Windows Azure. Microsoft Windows Cloud is created by so many different services and out of which, following are the some of the important services which makes Windows Cloud more fascinating. Picture worth 1000 words so after looking at image given above, you must have an idea about the essential part of Cloud offering by Microsoft. Let us have a look at each in brief here. In simple word, Windows Azure is the operating system provided by Microsoft for Cloud computing. Windows Azure is first reveled in Microsoft Developer Conference 2008 (PDC-2008). By the help of Windows Azure, Microsoft offers service hosting, service management for Azure Platform. Windows Azure provides you on-demand computing and storage to host, scale, and manage web applications and services on the internet in Microsoft data centers. Windows Azure is made up of following essential parts. Worker Role: Web Role is generally used to host the web application and make it available for the user, it shouldn’t be use for long running task like some heavy aggregation, heavy report creating and many more. to decouple front-end from web role, worker role is introduced to perform heavy wait task. You can consider it as Windows Service or a Unix Daemon. that it allows you to perform a great number of customizations at the operating system level. Table: Table Storage object serves as a regular table of SQL Server the only thing is, it won’t allow you to established relationship between two tables and hence it is known as NoSQL. Blob: Binary Large OBject (BLOB) is used to serve the purpose of storing image, files, audio, video and any unstructured data. This data can be accessed by HTTP or HTTPS from anywhere in the world. Queue: Windows Azure Queue storage is a service for storing large numbers of messages that can be accessed from anywhere in the world via authenticated calls using HTTP or HTTPS. A single queue message can be up to 64KB in size. SQL Azure is a cloud based relational database management system. It provides a highly available, scalable, multi-tenant database service. 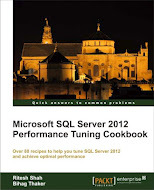 Data Synchronization: Microsoft SQL Data Sync is built upon the Microsoft Sync Framework. SQL Data Sync enables you to easily create and schedule bi-directional synchronizations from within the SQL Data Sync web site without the need to write a single line of code. SQL Data Sync supports synchronizations between multiple Windows Azure SQL databases and between SQL Server and SQL databases so you can create custom synchronization groups that fit your business requirements. Access Control: Access Control is great step take in Windows Azure which separate identity and access control from the application development process.Access control is provided as a feature of Windows Azure and it takes care of integrating your application with commonly used identity providers like Active Directory, Windows Live, Google, Yahoo, Facebook and Twitter. Service Bus: Service Bus is messaging infrastructure that sits between applications allowing them to exchange messages in a loosely coupled way for improved scale. The Service Bus provides both “relayed” and “brokered” messaging capabilities. In the relayed messaging pattern, the relay service supports direct one-way messaging, request/response messaging, and peer-to-peer messaging. Brokered messaging provides durable, asynchronous messaging components such as Queues, Topics, and Subscriptions, with features that support publish-subscribe and temporal decoupling: senders and receivers do not have to be online at the same time; the messaging infrastructure reliably stores messages until the receiving party is ready to receive them. Caching: Caching service provided by Microsoft Azure is a distributed in-memory cache for Azure applications. This gives developers an alternative to the disk based caching. Developers can utilize the caching service to store data based on an individual user session or to store and share data across the applications. Windows Data Market: Microsoft provides IaaS and PaaS but it is not enough. May user/business needs readily available software which they can use as a service (SaaS) with windows cloud. To cater the need, Microsoft has launched “Windows Azure Marketplace” which is online market place where you can sell or buy software. 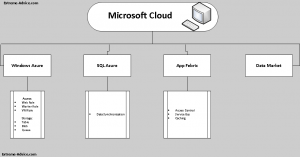 This entry was posted in App Febric, cloud computing, SQL Azure, Windows Azure and tagged App Febric, SQL Azure, Windows Azure on October 1, 2012 by Riteshshah. I am extremely impressed along with your writing talents as well as with the structure for your blog. Is this a paid subject matter or did you modify it yourself? Either way stay up the excellent quality writing, it is rare to peer a nice blog like this one nowadays.. I just want to mention I am just newbie to blogs and definitely liked you’re web blog. More than likely I’m likely to bookmark your blog . You absolutely have awesome writings. Many thanks for sharing with us your webpage.